Coffee and books, yes. Check out the mighty Boulder Bookstore or the ever so slightly closer to home Browsers in Woodbridge. Far as I know, no equivalent places in Felixstowe. 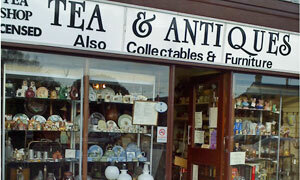 What they do have, however, is Tea & Antiques -- see map. Deal is that you wind your way between the gew-gaws and knick-knacks, pausing only to wonder about the ebay price of an 1970s Eagle annual, through a kind of hallway and emerge into a conservatory. It's got underfloor heating, you know. And they're licensed, hence the lady customer polishing off her (green) eggs and ham, washed down with a bottle of Stella. As you do. Then she left and we were alone. Ever had an entire cafe or restaurant to yourself? Even though there were three of us, you wished for piped music, maybe some lounge music or Mantovani. No papers to peruse but feel free to examine the for-sale greetings cards or horoscope placemats, as did Gemini "flighty" Grenvyle, Aries "common good" Andy and Taurus "stubborn" Yours Truly. Quite a choice on the erratically spelt menu, perhaps too much since some items turned out not to be available. Bits of our order didn't quite make it either, including Andy's bap ("defrosting problems") and the sweetcorn on my tuna spud. Jolly Green Giant, he not home. We didn't hang around for pudding. If it was a car -- Austin Ambassador. If they were passing by -- George Cole.